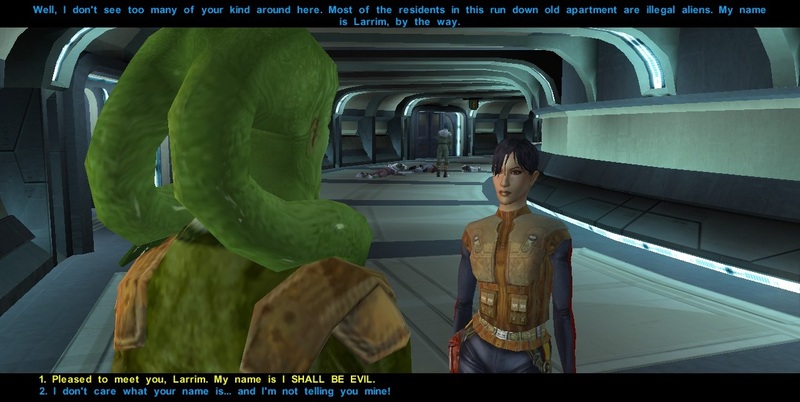 Detailing my adventures in the classic game KOTOR, in reverse chronological order. Restarted my entire game again (fourth time this round), because I managed to spoil myself on Revan's identity when researching about the game's ending and felt that my previous gameplay choices didn't fit what I wanted. Note to self: Cut down on worrying about the perfect ending and let the game flow. Picked a scoundrel this time with the intention of going down the evil path, while maxing out my 'persuading' skill (I'm gonna be a smooth-tongued criminal). Decided to go full range as well, so I robbed Carth of his blaster and gave him Viroblades to rush all enemies. Rocking two blasters always looked cooler, anyway. I progressed quite fast through the game (because I've been to Taris so many times) and am in the midst of tearing down the Vulkar base right now. It's surprising to see how despite my name (okay I know the AI won't pick it up) and me going on a pure evil streak like killing everyone or threatening them, my party members or the Sith are not the least bit suspicious about this human who is leaving chaos in her wake. Quite oblivious, they are. I guess that's how the game kind of "allows" you to be a dark side player. I wonder what Bastila will say when I save her, considering that my force points are in the negative region now?